Before you read anything else, consider this: don’t insulate your attic until holes around bath fans, kitchen fans, can lights, and other penetrations are properly air sealed! Air infiltration can account for up to 30 percent of a home’s heating and cooling costs. Air sealing will not only reduce energy consumption, it will create a healthier indoor environment by locking out dust, pollutants, insects, and other nuisances. Insulating with blown fiberglass is a traditional insulating method. It has an R-value of about 3.14 per inch, and because it’s sprayed into small, snow-like pieces, it insulates over ceiling framing to maintain an even layer of insulation over the drywall ceiling. 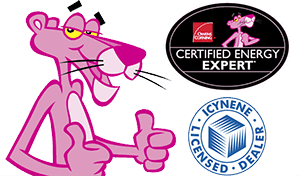 We’ve insulated Kingsport and Johnson City, TN attics with Owens Corning blown fiberglass for decades. In Climate Zone 4 (Kingsport, Johnson City, Bristol, Greeneville, Rogersville, Erwin, Morristown, Elizabethton, Abingdon, Marion, Norton, Wise), 2009 code requires an R-38 (about 12″) and 2012 code requires an R-49 (about 16″). If you don’t like the idea of blowing fiberglass to your attic floor, you can spray open cell foam in its place. Open cell foam has an R-value of about 3.7 per inch, but at 3-1/2″ you’re achieving a complete air barrier. So, not only is the attic being insulated – it is also being air sealed, and therein lies the real benefit of spray foam insulation. There are some ways to get creative with a hybrid system of closed cell spray foam and blown fiberglass, but we won’t go into detail with them here. Are your HVAC system and ducts in your attic? Then you could be a great candidate for open cell foam applied to the underside of your roof. Spray foam adheres to nearly anything, so in applying foam to the underside of a roof, we’re able to move the building’s thermal envelope from the attic floor to the roofline. Any time you can bring your mechanical equipment or duct-work into a semi-conditioned space, you’re improving energy efficiency and saving money. You’ll also have more room for storage on the attic floor! If you’re considering more attic insulation in the Johnson City, TN, market please contact us!